Building a virtual datacenter is one of the most critical skills for individuals who design and manage virtualization environments. More and more companies are turning to the use of virtual datacenters for data storage in applications including data mining, customer analytics, web analytics and more. Those companies seek IT professionals with the necessary skills to build effective virtual datacenter solutions. Whether you’re an IT professional looking to build a virtual datacenter for the first time or a veteran looking for a reference guide, VMware vSphere 5: Building a Virtual Datacenter covers every aspect of creating a virtual datacenter on vSphere 5. From design to troubleshooting, it offers information applicable to datacenters both large and small. This comprehensive guide comes from two talented VMware professionals: Eric Maille and Rene-Francois Mennecier, who begin with reviewing the fundamentals of datacenter design. From there, this VMware datacenter guide dives into the business of datacenter creation – budgeting, scheduling, planning and how to compare and evaluate different datacenter designs and solutions. They then cover technical aspects critical to a successful virtual datacenter. These include the integration of vSphere with datacenter elements such as storage, backup and disaster recovery. This VMware datacenter guide also shows you how to seamlessly integrate other VMware solutions such as ESX and vCenter Server, allowing you to easily manage all components of your virtual datacenter. 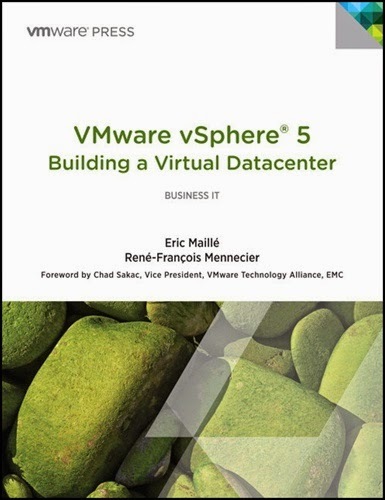 Once your datacenter is successfully running, Maille and Mennecier provide a wealth of knowledge on how to optimize performance and troubleshoot common issues within vSphere 5 virtual datacenters. From beginners to experts, there’s something for everyone in this guide, jam-packed with everything from the fundamentals of datacenters to advanced topics such as integration and optimizing your vSphere environment. Looking for more? Visit us at VMware Certification Marketplace for additional VMware books and reference materials that will help you master every aspect of the VMware platform, from designing and deploying vSphere to the development of applications using the VMware SDK!